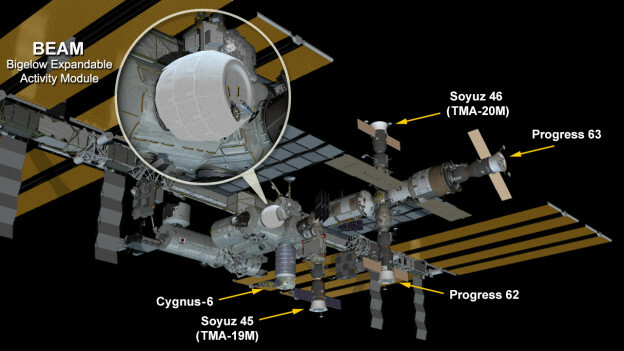 Pressurization of the Bigelow Expandable Activity Module (BEAM) began at 4:34 p.m. EDT, and the eight tanks filled with air completed full pressurization of the module 10 minutes later at 4:44 p.m. BEAM’s pressure will be equalized with that of the International Space Station, where it will remain attached for a two-year test period. Expandable habitats are designed to take up less room on a spacecraft but provide greater volume for living and working in space once expanded. This first test of an expandable module will allow investigators to gauge how well the habitat performs and specifically, how well it protects against solar radiation, space debris and the temperature extremes of space. For more information about BEAM, visit: www.nasa.gov/beam. For more information about the International Space Station, visit: www.nasa.gov/station. also be stretched. Or is this an intermediate image?